Well, the Christmas build up is in its most intensive phase for the next 10 days and I'm late with everything - of course! There are certain things that I like to do every Christmas and so far, I'm not sure I've managed more than one or two small things. But we've started one or two new traditions this year which is nice. 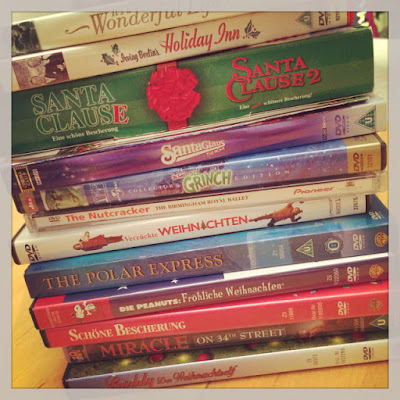 What is definitely missing is the time I need to watch my nice pile of Christmas movies which I like to work through in the run up to the big day. Therefore, in the absence of me actually watching any of them so far, I think we need to make them this week's prompt. So, be inspired by Christmas movies. Everyone has a favourite. Mine is Holiday Inn for sure. Classic black and white Fred Astair and Bing Crosby with the original version of White Christmas. Who could ask for more? But there are also plenty of modern films in my collection, how about you? As always, I think there are many ways to take this inspiration - whether it's just about your favourite, or your collection. Childhood memories, or traditions. Identifying with the characters - I have a good memory that's very similar to Clark Griswold's tree that I might retell - or how they reflect your thoughts on the festivities at this time of year. Take it in any direction you like! I'm late uploading a few into the Whimsical Musings Flickr gallery but if you create, it would be lovely to see you there too. Don't forget to tag your creation with WM#193 so we can find you. I'm in the mood for a little giveaway in celebration of this special time of year, so I'll put your name into the hat for any comments on this post and double points for a layout in the Whimsical Musings Flickr gallery - who doesn't love a giveaway?!? And who doesn't like Lisa's giveaways? I have a stack of Christmas movies also, that set the tone for the season. As today is a pj day, I hope to produce something to share with you.